Not many things about the Dallas Cowboys performance through two weeks has been pretty, but when they look up on Monday morning they'll be leading the NFC East at 1-1. Evening their record with a win on Sunday Night Football against the New York Giants, the Cowboys did enough in front of their home crowd to hold off a late Eli Manning comeback. Tavon Austin's long opening touchdown would set the tone for the Cowboys on their first possession. 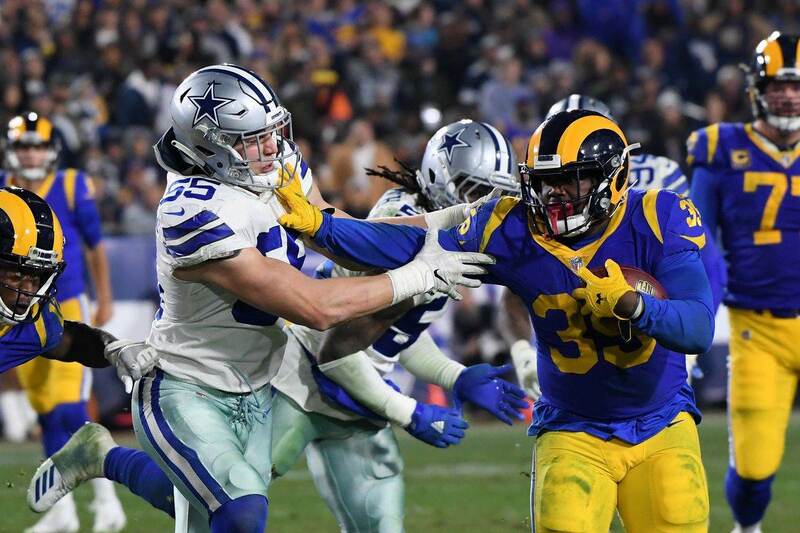 Points would be at a premium for both teams the rest of the way, leaving the Cowboys with plenty to like about their defense and reason to be encouraged on offense. Here are my full takeaways from the Cowboys first win of 2018. There aren't enough good things to say about the play call from Scott Linehan to get the ball over the top to Tavon Austin for the Cowboys first touchdown. The Cowboys were able to take advantage of Giants Safety Landon Collins playing down in the box, something he's had success doing against Dallas before. I thought that trend could continue when Collins called out the Cowboys offense leading up to this game, but it was Dak Prescott getting the last laugh. 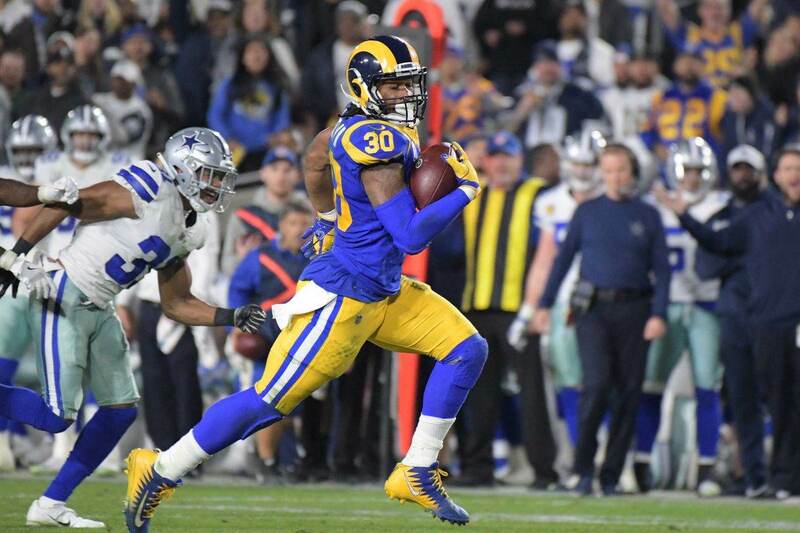 Prescott knew exactly where the ball needed to be placed once Austin beat Janoris Jenkins cleanly, giving Tavon room to run under it and find the end zone for the first time as a Cowboy. It was another tough match up for rookie Left Guard Connor Williams, but this time he was up for the challenge of playing on the second level and getting out in space. The Cowboys should be happy with Williams' steady progress at LG, as he took another step forward on Sunday night. A converted tackle from college, Williams looked much better playing on the move, which is when the entire Cowboys OL is at its best. Not only was Williams comfortable handling more wrinkles in the play book, but he was able to play with improved power and leverage to get to the second level often. With Center Joe Looney holding his own against Damon Harrison, the Cowboys went back to their roots in grinding out this NFC East win. That's a fantastic play by Jeff Heath to run across the field and tackle Evan Engram short of the line to gain on third down. The Giants drive would continue with a fourth down conversion, but the Cowboys defense did eventually force a punt. The Cowboys safeties were primarily called upon to play in run support in this game, a role Heath has struggled in previously. Showing off his strengths as an athletic and rangy defensive back on this play, Heath didn't get pushed up the field by Engram on his release, hunting him down after the catch in front of a fired up Dallas bench. Speaking of the Cowboys safety usage in this game, it was a standout performance against Odell Beckham Jr. and the Giants receivers by Cornerbacks Byron Jones and Chidobe Awuzie. Both Awuzie and Jones were asked to play on an island for much of this game, and handled this as well as Kris Richard could ask for. Beckham's longest reception was for 17 yards. The Cowboys kept the Giants best play maker in front of them all night, giving them a fighting chance to slow down RB Saquon Barkley. 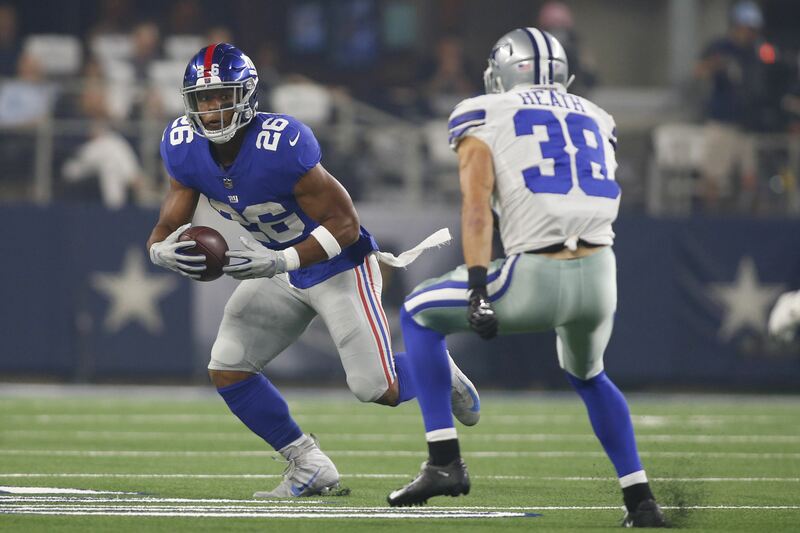 Barkley was able to punish the Cowboys front seven a number of times with broken tackles, but never escaped the Cowboys grasp enough for the Giants to sustain a drive until the fourth quarter. I'm not sure if the Cowboys strong cornerback duo of Awuzie and Jones were expected to play this well as early into the season as we are, but their man coverage ability has really allowed Dallas to mix things up on defense. Kris Richard's impact on the Cowboys defense went beyond the secondary play against the Giants, as the team remained aggressive in blitzing the Giants offensive line. It sure felt good to see the Cowboys exploit the Giants weakness up front, not content with letting their front four create the only advantage on defense. Knowing what Eli Manning is capable of when sitting in the pocket, the Cowboys disrupted the Giants passer all night by relentlessly sending stunts and blitzes at him. Damien Wilson had a bounce back game at linebacker by using his speed to pressure Manning. Getting home for a game-changing sack, Wilson knocked the ball out of Manning's hand and created a turnover for his defense. Defensive End Taco Charlton, who had a sack from the RDE position, recovered the fumble for Dallas. It was the right side of the offensive line for the Giants that let them down, but with so much attention being given to DeMarcus Lawrence at left end, Charlton simply had a free run at Manning for his sack. That's a bad miss by Dak Prescott of Rico Gathers in the end zone off the Cowboys only turnover. Looking to put the game away after their fumble recovery, the Cowboys called the perfect play for Tight End Rico Gathers - who was active in a regular season game for the first time. The play became an example of just how far criticism of Scott Linehan should stretch, as Prescott simply didn't execute. Gathers sold his route up the field perfectly, breaking for the back corner of the end zone and running to open space before finding the ball sail over his head. Had Prescott thrown a better ball, Gathers turns around and easily secures a touchdown. Who knows what the internet would be like this morning if he did. Nonetheless, the Cowboys settled for a Brett Maher field goal and took a 13-0 advantage before the Giants began their climb back into the game. The Cowboys shouldn't be discouraged from using Gathers more in the passing game, but whether or not they will depends on the numbers they need on the active roster each game day. The only NFC East team to earn a win in week two, the Cowboys have a long way to go to prove they're contenders in the division. 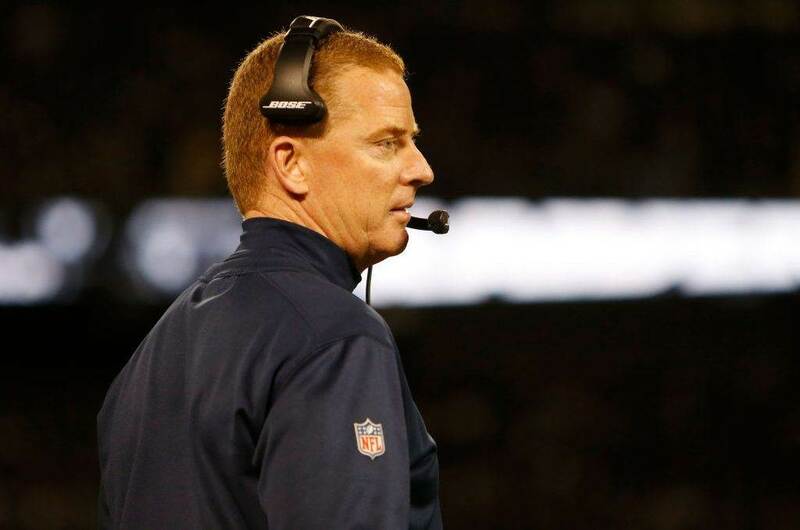 With the Seahawks coming to town this week, the Cowboys will be reminded of how quickly things can go wrong, as Seattle's win in AT&T Stadium a year ago ended their hopes of making the playoffs. On Sunday night, it was the Cowboys hindering the Giants chance to do just that by forcing an 0-2 start in New York. The Cowboys were impressive in their control of the game, executing a great game plan on defense while the offense started fast and finished with a physical drive in the fourth quarter. Getting back to work after a win is always best, and such is the week ahead for the Dallas Cowboys. Tell us what you think about "Sean’s Scout: Secondary Play, Improved OL Stand Out in Cowboys Win Vs. Giants" in the comments below. You can also email me at Sean.Martin@InsideTheStar.com, or Tweet to me at @SeanMartinNFL!